As a sub-segment, the condo market has borne the brunt of the bad press with a drastic reduction in trading, prices plummeting, and an overall lack of confidence in the sector. Locally this segment is still smarting from three years of inertia, and although 2011 saw a 20% YOY increase in absorption, there is still considerable supply being carried by developers. With no price growth and uncertainty about future appreciation, owners are now turning their focus to operations to ensure that their properties are generating the maximum cash returns. In recent years, the condo market has benefited from the well-established global trend towards more flexible accommodation where families or groups can stay together rather than sharing multiple hotel keys. Recent metrics support this trend as a number of newer developments begin to demonstrate stabalised occupancy and reasonable cash returns. The chart below (Figure A.) 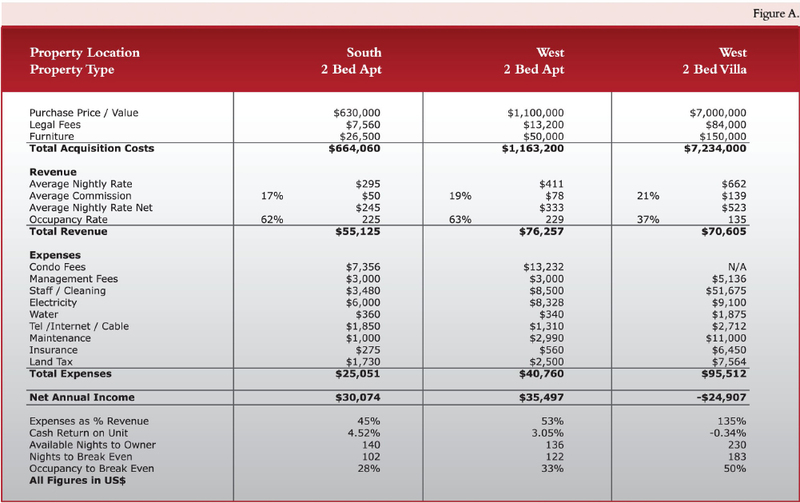 illustrates the actual cash returns generated from condos on the south and west coast beachfront over a representative twelve-month period. We have also included a villa, which perhaps serves only to illustrate the fact that generally speaking the villa product rarely produces much beyond operational expense coverage. While some of the west coast beachfront villas achieve up to US$15,000 nightly in season, the expenses tend to run disproportionally high against revenue. This is principally a function of two categories; the salary and wages expense related to staffing and secondly the electricity charges which are becoming increasingly onerous. By and large metrics are harmonized across both condo units with occupancy at 60%, average commissions at 18% and operational expenses running at approximately 50% of revenue. Where they differ is in the cash return. The south coast unit has a 48% increase in net cash return over the west unit and correspondingly a lower occupancy to breakeven threshold. This is due to the fact that the differential in average nightly rate is not paired with the differential in value between the two units. Whereas the west has a 75% higher purchase price/value, it only manages a 39% premium in average nightly rate. Traditionally there has been no discernable difference in the rate of appreciation/price growth for beachfront condos on the south versus the west, so one could therefore reasonably conclude that the overall return (say over a 10-year horizon) from a condo on the south would be more favorable than one on the west. Of course the reality is that for most purchasers lifestyle choices and pride of ownership trump returns, but perhaps this illustration argues that a well-managed unit can and should produce a cash return in the 3-5% range.